Accompany any ManCode conference or session with The ManCode Field Manual. 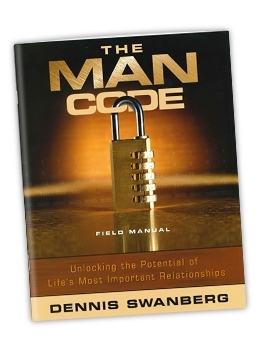 The field manual for “The ManCode” is designed to accompany the 6-lesson video study by Dennis Swanberg. Each lesson includes an introduction to the topic of the session, key points of Swanberg's video presentation, discussion, summary, prayer, and five daily Bible readings. Effective use of the field manual will ensure that men who participate in the study will take part in lively discussion and interaction. Ideally, every man should have a field manual to use in the study to keep as a valuable reference for years to come.